Once the Las Vegas Strip was dominated by acts featuring lions and tigers, but times are changing and the public is turning its back on inhumane entertainment. In recent weeks, we've seen indications that Cole Bros. Circus may be going animal-free; Ringling Bros. announced they’re taking their elephants off the road; and now Vegas is finally rid of these inherently abusive exotic animal acts. 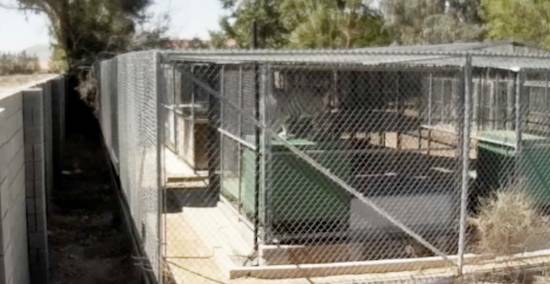 Dirk Arthur keeps 13 exotic cats in these cages in his back yard... The cats in the show spend about six hours a day in small cages being transported and waiting backstage in even smaller prop boxes. According to the Westgate Las Vegas Resort and Casino, Dirk Arthur’s Wild Magic show - the last Las Vegas act featuring exotic animals - has been canceled! A local entertainment site announced the show had “abruptly closed” and refunds are being offered to ticket holders. The news is a welcome victory for the white tigers, snow leopard, panther, and other exotic cats used as props in the controversial show. ADI previously released video of the extreme confinement and environmental deprivation suffered by exotic cats in Dirk Arthur’s Wild Magic show when it opened at the Westgate last year. The exotic cats appear only minutes onstage, but for this endure around six hours a day in tiny travel cages and prop boxes barely larger than their bodies. ADI will continue to monitor this situation and will work to get these long-suffering cats retired to a reputable sanctuary.